If you've been following Les McClaine's blog -- and you should be -- then you already know that over the past two months, the artist of The Middleman and The Tick has been doing something amazing. 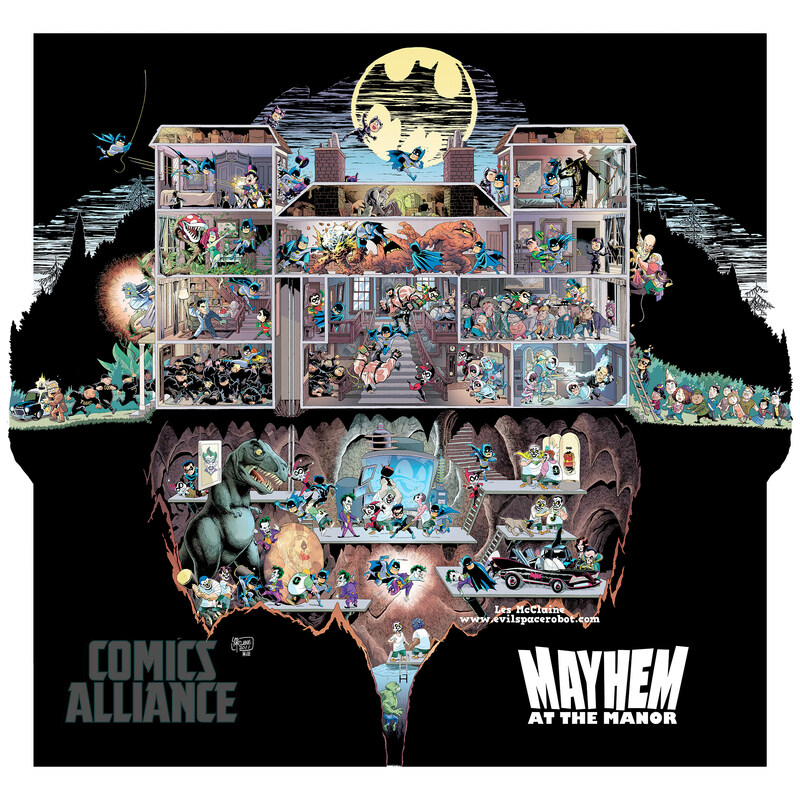 In an incredible panoramic piece of art called Mayhem at the Manor, McClaine has been telling the story of an assault on Wayne Manor by an army of Batman's greatest foes through a cutaway packed with incredible details and a massive cast of heroes and villains. McClaine has been releasing Mayhem at the Manor room-by-room in black and white, but today, he and colorist Ryan Hill have allowed ComicsAlliance to bring you the full image in eye-popping color! Check it out, along with commentary on our favorite parts, after the cut! I've always been a total sucker for cutaway-style action pieces, and the incredible action that McClaine puts into his work is just beautiful. The way he uses the walls as panel borders to define individual moments -- Two-Face going through the window, Alfred fending off Mr. Freeze with his frying pan, the mansion being invaded on both sides by mind-controlled Gothamites and assorted Thugs and GOONs -- the way the action splits off into different directions but still stays so easy to follow, the beautiful energy of it, it's all just absolutely perfectly done. The Portraits of Bruce Wayne's Romances: Who knew knew the Dark Knight was so sentimental? He keeps framed pictures of his old flames in his house: Batwoman (Kathy Kane), photojournalist Vicki Vale, and even -- Spoiler Warning For an 18 Year-Old Movie -- Andrea Beaumont in her guise as the Phantasm. Sort of an odd thing to have hanging in your front room, but rich people are eccentric. Poison Ivy's Piranha Plant: Apparently, before Man-Bat got hold of Bruce's old NES, Poison Ivy was inspired by the events of Super Mario Bros. 3. 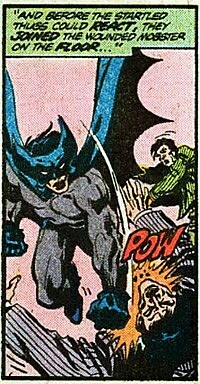 The GOONs: The same members of the Grand Order of Occidental Nighthawks that are confidently charging through the front door are falling over themselves in full-on terror trying to escape from Batgirl's fun-loving, face-kicking assault, to the point where they're actually running towards Batman. Batman's Deadliest Foes: Egghead, King Tut and the Bookworm. The best part, though, is that with the addition of one enemy -- the only one who's not actually present in Wayne Manor or the Batcave -- McClaine has created a narrative that explains just why all this stuff is happening. In short, it's an absolutely phenomenal piece that was well worth the months of work that McClaine put into it, and Hill's incredible colors make it pop even more. Ryan Hill is the upcoming colorist for Dark Horse's House of Night and Dark Matter.